Game after game, Celtics fans across Boston face the same, painful decision: basketball or bedtime? Waiting in line for coveted tickets yesterday morning, George Hutt fondly recalled lazy weekend afternoons at his parents' home in Hingham, watching Celtics playoff games while the sun still glowed through the windows. But games this series have all started well after dusk, and the longtime fan has surrendered to heavy eyelids and the allure of digital recording. "I hate it," said Hutt, 42, who lives near TD Banknorth Garden. "The only game I watched in its entirety was [Sunday] night, because I thought it was going to be the championship." Tense midnight moments have quickly turned into sleepy mornings in boardrooms and classrooms across the region, and have left parents, youngsters, and radio talk show callers asking the same simple question: Why? Why do the games have to start at 9 p.m. and end so late, even on Sundays? The answer, according to the National Basketball Association, is that the late start time allows the most people across the country to watch the games and appears not to deter even those who complain. "It may be counterintuitive and against conventional wisdom, but there is no indication that the younger audience is impacted by later start times," said NBA spokesman Michael Bass. "And the reality is, if it's past their bedtime, in this day and age, kids in particular are extra tech-savvy and are finding ways to consume the game online through nba.com or YouTube." But marketing specialists warn that the broadcast strategy may backfire, as children struggle to stay awake until the final buzzer. "From an advertising perspective, from a common sense perspective, what the NBA is doing is clearly excluding a whole generation from being able to watch their games," said Christopher Cakebread, advertising professor at Boston University. In 1986, the last time the Celtics made the finals, three games, including two on Sundays, were broadcast earlier in the evening, Bass said. There were also two earlier broadcasts during the 1987 championship series, he said, but since then the NBA has been starting games at 9 p.m. The league is not alone. The NCAA men's basketball tournament and the World Series both start in prime-time spots. Sports are no different from popular television shows, trying to maximize their audience and advertising rates by starting at 8 p.m. or later, Bass said. Viewership of the finals has varied game to game. Game 5 was watched by more than a million people in the region, according to NielsenTV tracking data. But Joseph Johnson wasn't one of them. The 11-year-old Celtics fan, in town from Chicago visiting family, said that even the raucous championship atmosphere could not keep him awake. 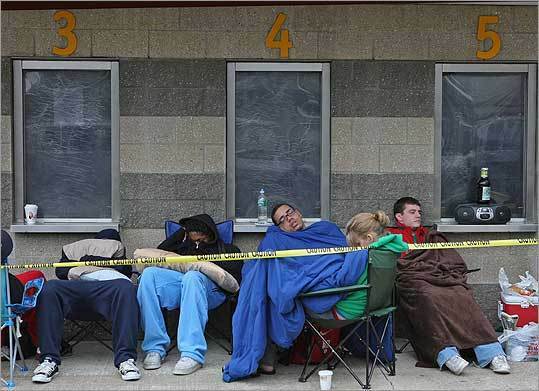 "I fell asleep in the fourth quarter," he said, as he waited in line at the Garden for Game 6 tickets. The question remains whether the NBA's plan will engage children who have not yet been captured by the sport, said Cakebread. "Marketers aren't known for thinking long term," he said. "They're thinking, 'How much interest can I attract to the brand at this moment? We'll worry about 2012 or 2015 later.' "
But with the Celtics on the verge of their first championship in two decades, any disengagement was hard to detect yesterday at the Holland Community Center in Dorchester. Eric Brito, 10, said he watched all of Sunday's game, but felt it in the morning. "I couldn't wake up, and then I fell off the bed," he said. Giovany Perez, 8, said his mother made him go to bed Sunday evening, but he sneaked back to watch the game on television with his sister and brother later that night. Even some parents who have held a hard line throughout the playoffs are begrudgingly making late-hour exceptions for the finals. "I got little kids, you know, and they want to watch the game," said Doug Coughlin, 40, of Revere, who was wearing Celtics gear in the ticket line yesterday at the Garden. Even Hutt, nostalgic for a time when sleep and slam dunks didn't conflict, plans to give up a few more hours of shut-eye to see the Celtics play tonight. And he will actually be in the Garden if it comes to a Game 7. But, he said, "we're rooting for no Game 7." Christopher Baxter can be reached at cbaxter@globe.com. Maddie Hanna can be reached at mhanna@globe.com. the green room Am I the only one worried?